Phang Nga is often voted the “happiest” province in Thailand. It might have something to do with the abundance of natural beauty in this province. There are waterfalls, tropical islands, marine parks and national parks like the famous Khao Sok National Park. This park is close to Rawai Muay Thai, only about 1 hour North of the camp. There are buses that make the trip and you can organize day trips from the gym. Just ask the gym office staff to help you. Visit the Elephant Sanctuary. Most elephants in Thailand either work in the logging industry, or carry tourists around. However, you can find a few places where these magnificent gentle giants are still free to roam around, without having to perform or work. One such place is the elephant sanctuary in Khao Sok. Here the elephants go about the daily life and the tourists follow them, watch them, feed them. You are even allowed to bath with the elephants. Truly a unique experience. Stay overnight in the floating bungalows. There is nothing better for the soul than to get away from it all. And that’s what this experience gives you. A retreat like no other. Sleeping on the water and surrounded by nature. No mobile reception, no emails, nothing but plants and animals. A chance of a lifetime. 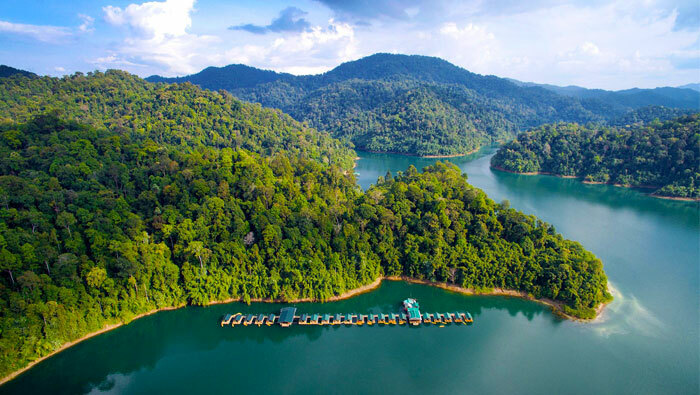 When visiting Khao Sok National Park, you must take a lake tour. The lake in Khao Sok is called Cheow Lan Lake. It is huge and features towering limestone cliffs. The tours are either in bamboo rafts or long tail boats.